I know that updates have been sparse lately, but I blame that on the work schedule being a bit wonky. One of the drawbacks of rotating shifts, I guess. When I haven’t been working, though, I’ve been keeping myself busy – and not with my Sims game! I’ve noticed time just slipping right away when I play, so I either need to set a timer, or just concentrate on the other things that need doing. This week I’ve been really good and just concentrating on the knitting. 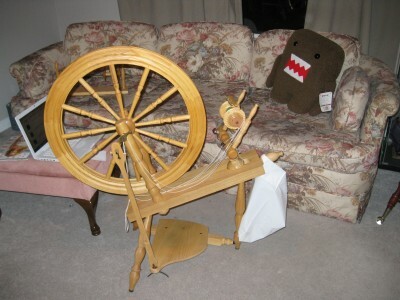 First, though, I’ve gotten back to the spinning. This has been the one thing that has made the most progress over the course of the week. I had previously finished the bobbin on the left, and over the course of the last week, finished up the bobbin on the right. 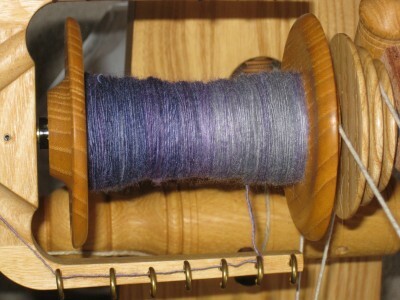 I’m currently working my way through the third and last bobbin, after which I will start plying. Hooray for making my own yarn! This looks suspiciously like a mitten, but it may not stay that way. I think it’s way too small, and way too thin for a northern winter. And when I say “northern”, I actually DO mean arctic! 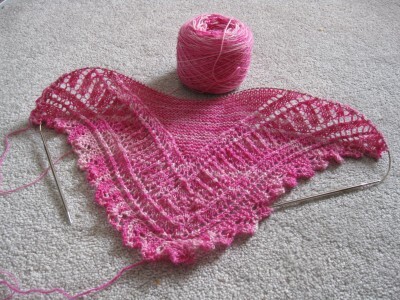 I’m thinking that this particular yarn will be frogged back and knit into a delightful scarf for a wee fashionista who loves the colour pink. It’s Zauberball Starke 6, so it’s thicker than the Crazy Zauberball, but apparently not by much. I will go on the search for more girly-coloured Noro later on. Possibly on the weekend. Work on Robin’s sweater is continuing. I’m on the second sleeve, and while I’d show pictures, it’s really a matter of “second verse, same as the first”. Needless to say, the Husbeast is happy to see that the sweater is more than mostly theoretical! Today is a snowy day that sorta took us by surprise. I’ve been working night shifts this week, and with a wind storm this past Sunday, I’ve been watching the weather to see if there will be anything I’ll need to be aware of when I leave the building at midnight. Snow is pretty and hides a multitude of backyard sins. Isn’t that a beautiful sight? And that triangular thing? That’s my drying rack. I guess that I won’t be drying knit socks on the deck for awhile, eh? The leg knits faster than the cuff. Seriously. 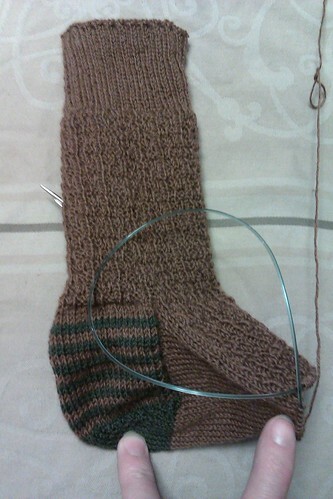 I’m now at the point where I can turn the heel on Sock #2 of the Gentleman’s Railway Socks. I’ve been grooving away on the leg pattern and just doing what I can in the time I have. Unfortunately, I left my “main knitting” at home last night, so I had to do something else on my lunch hour. Image enhanced as the pattern got lost in the front hallway lighting. Does that leg look smaller than the last update? Yes, unfortunately. I wound up with an extra yarnover somewhere, and when I tried to “fix” the issue, I wound up with a nice ladder-effect from the dropped extra stitch. Whoops. So I spent my lunch hour last night tinking back about the same amount of rows I would have knit. The upside to this is that I’m now ready to start knitting in pattern again! I’m a little cheesed that I didn’t get my November socks finished by the end of the month, but I will admit that my Sims addiction got the best of me. I know that I mentioned that I wasn’t sure I’d be doing a “Skinflint Sock Club” sock for December. 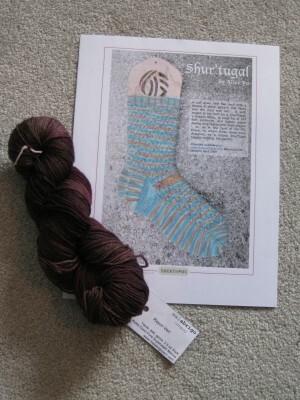 I’ve decided that I’m going to post the sock of the month, and if I can get to it…damn skippy I’ll knit it! The Sock Knitter’s Anonymous group on Ravelry theme for this month is an interesting one, and I’ve chosen a sock that I think will be a fun one: Sidewinders! I’ve got some self-striping Regia kicking around the stash, so I’m thinking I will drag that out and try the Sidewinders. They definitely qualify for Unique Construction! Feel free to join me! Things are progressing a bit better with the Gentleman’s Socks than they were. The Lion Brand is really shaping up, and I’m very happy to be working with my regular 2.5mm needles. I really need to get a pair of 2.25mm Addi Turbos to bridge the gap between the really wee needles and the somewhat wee needles, if you know what I mean. Heel turned and gusset done! Booyeah! The contrasting colour in the heel is some Louet Gems that I had left over after making the Ishbel Beret (pattern by Ysolda Teague) a year or two ago. I’m not sure I like the baggy-ness (is that a word?) of the heel, but since I know that the Husbeast has a hard time with socks fitting in the heel, the extra width might be good – (not that these are going to the Husbeast, of course, but with the men in this family and their foot sizes of “Big” and “Holy crap, those are huge, you walk on those?! ?”, I’ll take what I can get. Another WIP Wednesday! Things are continuing. The February Lady Sweater has pretty much gone back into procrastinatory hibernation (but will likely be pulled out when the whim strikes). The design-socks are still being kept away from cameras, and that leaves two things. Two?! Yes. Two. A Shawl! Well…whatever it is, it’s sure a bright pink. That’s the Brandywine Shawl, designed by Romi Hill, and I’m attempting to knit it from Allison Avery Premium Hand-Dyed Yarn (colourway: Girlie). If the yarn looks familiar, it means you have a good eye. I attempted a homebrew version of Stephanie Pearl-McPhee’s Lenore out of that yarn. It was ripped back when I realized that the challenge had gone out of the project and the yarn was a little thin for the task of being lace socks. It’s not the only thing I’ve attempted from it. I tried a plain pair of socks (flashing & pooling issues) and a pair of socks that used some pretty fancy yarn-overs (thinness of the yarn, again). I think it works great as a shawl! Much nicer! 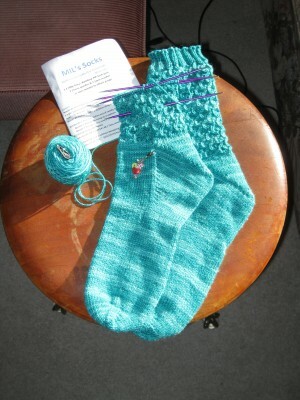 Second thing on my needles is my Shur’tugal Socks by Alice Yu. They’re my March Skinflint Socks. Say it with me: Mmmmmmalabrigo! 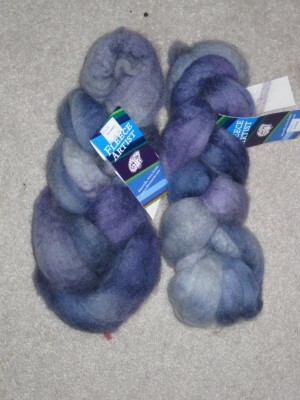 Apparently, March is “Malabrigo March” or “Malabrigo Madness”. I can get behind that! Last on the list is the spinning. We’re down 50g of Fleece Artist BFL Sliver and have started the second 50g. I’m thinking possibly of doing a 2-ply. Might be fun! 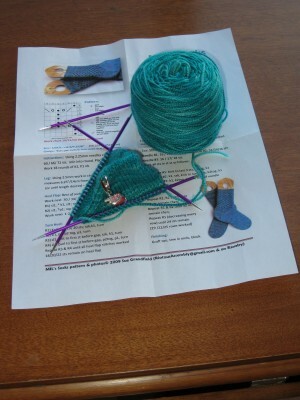 Last week’s WIP Wednesday showed this single, solitary, cast-on that was barely recognizable as a toe. This week, I have a bit more to show. Yep. That’s a full sock and a half. Okay…a little more than a sock and a half. More like a sock and three quarters. That’s what an illness in the family and being snowed in will do for you. Actually, I’ll clarify that a bit. Robin has shingles (if you didn’t listen to the podcast, you might not have surmised that). He started feeling “unwell” last week, and we were hoping he’d be better by the time we got to our vacation, but it was not to be. We wound up at the Doctor’s office on Friday to get the antiviral medications, then the ER on Saturday due to some side-effect complications. Obviously we weren’t going to get out and do anything with Robin feeling poorly (plus, he practically slept nonstop through the rest of Saturday and into Sunday), and then we got some snow. Enough that folks weren’t going very far very fast. I also celebrated a birthday, but that’s a post for another time! During our self-imposed “quarantine”, there wasn’t much for us to do but watch movies & keep busy. Well…Robin had the task of healing up. He’s almost all better now. I got a lot of knitting done. I figure I’ll likely be finished these in another couple of days. The Estelle Cadenza yarn is nice to work with. Reminds me a lot of a lighter version of the Socks That Rock Mediumweight that I had tried a couple of years back. I can’t exactly liken it to STR Lightweight, since I haven’t used it. I thought that with the variegation in the yarn, I’d get some interesting colour from it…and got stripes. Just what I had recommended against for the February socks (headdesk). Ah well…they still look beautiful. Not sure if they’re going to stay with me, or get set aside for a birthday or Xmas present for someone. You never know in this family. The pattern is pretty easy, though I’ve been freestyling my way through it. It’s written for cuff-down, and I’m doing it toe-up. Because I’m on a toe-up kick. Either way, I’m loving the way they’re turning out, and I’m particularly liking my DPNs for speed in the areas where I don’t have to do any kind of purling back. I will admit to being a jam-tart & putting the socks back onto the circulars just for the heels. Something I have to work on, I guess. Yesterday was the start of the Skinflint Sock Club, and I cast on at lunch hour, as soon as I had time (my time before work was taken up with the administrative duties and playing with the ball winder & swift). By bed last night, I’d managed to get about three inches knit. No, that’s not three inches. In fact, that’s barely more than one. Why? 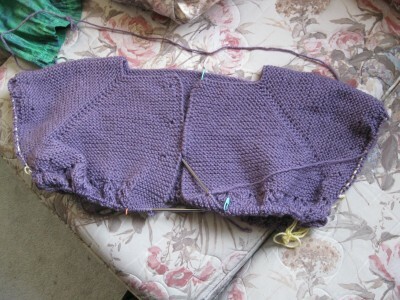 I had cast on for the medium size with 66 stitches…and found myself with a sock that was too big. How was this even possible?! Um. Yeah. The yarn is thicker than normal. That threw off my gauge. So I put in a line, ripped back, tinked another couple of rows & picked up where I left off…at 60 sts. around. Problem solved. 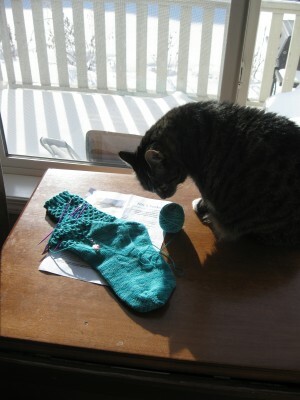 I also dropped down to four needles (3 in the sock, 1 to knit with) from five. The needles are really pointy, and I wasn’t happy with getting my hands stabbed every time I turned the sock around. So…three needles around, 1 to knit with, and I’m a much happier little muffin. Oh, and the whole weight loss thing that is an ongoing, photoless project? According to work, I’m down 15 lbs. I’m not taking it seriously, as I don’t know if the work scale is correct, but I’m definitely 10+ lbs down. Huzzah!